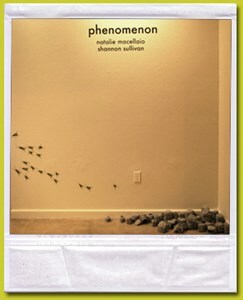 Phenomenon is a blending of Dallas, Texas artist, Natalie Macellaio and Arcata, California artist, Shannon Sullivan's interests in the physical world. 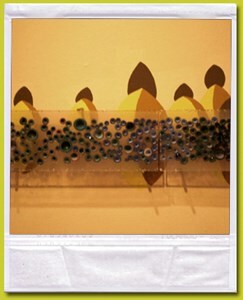 Forms are reinterpreted as the artists look at, react to, and contemplate nuance in nature. 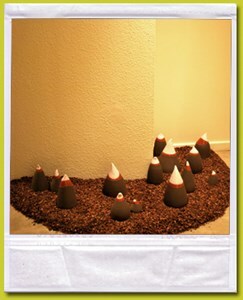 Working with fired ceramic and mixed media, Sullivan finds intrigue in microscopic cell forms or macroscopic sprout clusters, creating pieces that are tactile, viscous and sensuous. 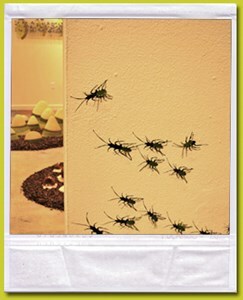 Macellaio finds disgust, interest, and intrigue within the world of insects. Using sheet metal and resin she interprets life cycle, chaotic balance, adaptation, and the significance of arthropods in every aspect of life. 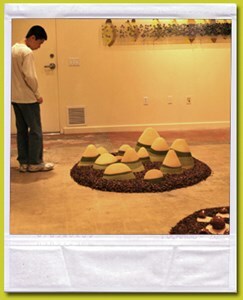 Both artists investigate an understanding of how simple entities can be complex in their reproduction. While honoring the prevailing ways of nature, these two artists create significance in scenarios that are always occurring, but rarely celebrated, revealing a stunning vocabulary of forms and ideas.